Dr Stringer is a theoretical physicist whose research career originally focussed on cosmology and galaxy evolution, until his mounting concern for our own planet bought him back down to Earth to work on terrestrial problems. 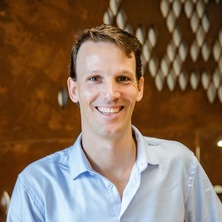 Since then, he has been applying the various mathematical modelling techniques developed over ten-year career studying the formation of galaxies to a variety of other systems, from models of island reforestation and interacting wildlife populations, to future systems of power generation, resource supply chains, and energy markets. Star formation trends in high-redshift galaxy surveys: the elephant or the tail? Stringer, M. J. and Benson, A. J. (2008). Modeling the formation and evolution of disk galaxies. In: Pathways Through An Eclectic Universe. Conference on Pathways Through and Eclectic Universe, Santiago del Teide Spain, (500-501). Apr 23-27, 2007. Kefford, Benjamin, Schmeda-Lopez, Diego, Stringer, Martin, Greig, Chris, Smart, Simon, Small, Mitchell and Wong-Parodi, Gabrielle (2018). Identifying regionally dependent barriers in the Carbon Capture and Storage industry. , School of Chemical Engineering, Dow Centre for Sustainable Engineering Innovation.